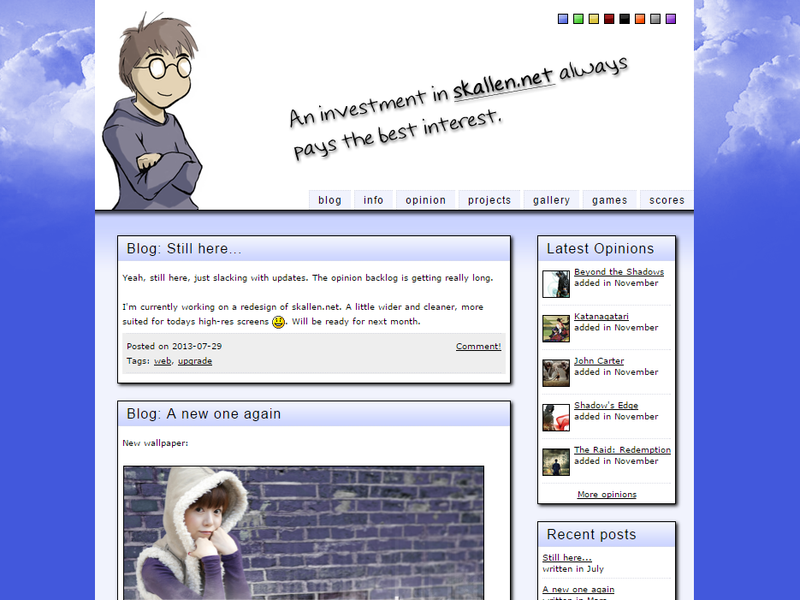 Hello and welcome to skallen.net. A collection of media I've consumed, with short notes and ratings. Not very much, but its something. But as I mentioned, the site is mostly for my own benefit. I use the opinion pages to keep track of what media I've consumed and what I thought, and since I'm a heavy rewatch/rereader, it's a good resource for me as well. I also use the gallery to upload and share images with other people. But mostly I use the site to try out web stuff and play around with website design. This as been great for me, as I've been able to use the skills I aquired from this many times at work. Lightbox, for nice looking image popups. Bluff, for the graphs on the opinion pages. The drawing to the left was made by Rickard Widmark. 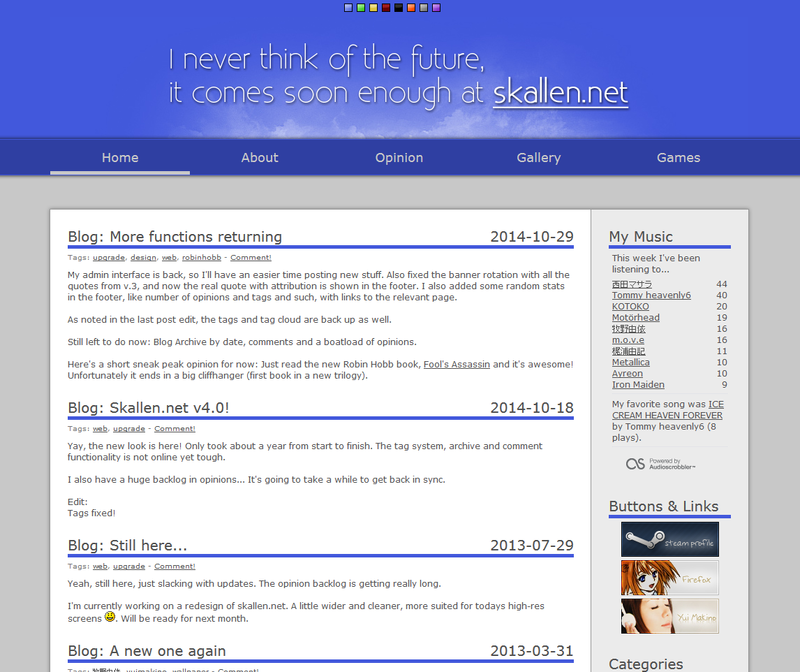 The first real version skallen.net, but barely. Had virtually no content except a few posts and images. Before this one I only had a logo and a shoutbox. 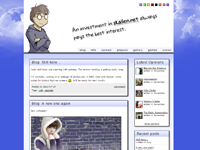 Blog posts (called "news", didn't know about blogs back then). Shoutbox. Polling. HTML image gallery. Link submit/vote system where users could submit and vote on different links, but never got it to work properly. A much better attempt than version 1. A completely new content system that still being used now, with some modifications. Seeing it now, it's a very narrow page, but resolution on the screen wasn't as wide as it is now. Flash animated logo (>_<). Name comes from web 2.0 which was very hot at the time. Autogenerated gallery. Comments. Two flash games. Simple layout system. Web administration. RSS. A wider site, heavily inspired by last.fm's look at the time. The design lasted a long time, but many features were built after release. Started with three different themes the user can switch between, now up to eight themes. Gallery with auto-generated thumbnails and lightbox viewer. Opinion system for rating media. Highscore for the games. AJAX on various functions. Rotating text banners. Again a wider site, following the increased resolution now available. This time inspired somewhat by windows 8, with a more flat look. More lean, with removal of a lot of unused stuff. Not much new features yet.